Welcome back Junior Bender! The smoothest, classiest, fastest talking (and funniest) burglar is back in action. In this fifth book in the series he’s crossed a Hollywood studio executive who happens to dabble in violence and revenge. In order to save his own hide, Junior must commit a series of burglaries that range in difficulty from insane to impossible. In the midst of this he's also trying to keep his estranged daughter from being scammed, placate his ex-wife, and repair his relationship with his girlfriend who may or may not be a murderer. Full of memorable, wisecracking characters, this caper novel is a wild, laugh-out-loud, breathtaking ride. Hollywood burgler Junior Bender finds himself caught in a revenge plot epic enough for the silver screen. Los Angeles’s most talented burglar, Junior Bender, is in the middle of stealing one of the world’s rarest stamps from a professional killer when his luck suddenly turns sour. It takes an unexpected assist to get him out alive, but his escape sets off a chain reaction of blackmail, strong-arming, and escalating crime. By the time Junior is forced to commit his third burglary of the week—in the impregnable fortress that’s home to the ruthless studio mogul called King Maybe—he’s beginning to wish he’d just let the killer take a crack at him. Timothy Hallinan has been nominated for the Edgar, Nero, Shamus, and Macavity awards. He is the author of seventeen widely praised books, including The Fear Artist, For the Dead, The Hot Countries, Crashed, Little Elvises, The Fame Thief, and Herbie’s Game, which won the 2015 Lefty Award for Best Humorous Mystery. After years of working in the television and music industries, he now writes full-time. He divides his time between California and Thailand. "The tricky plot is plenty funny and packed with colorful characters." "[Hallinan] proudly carries the banner of the late Donald Westlake, whose books are the gold standard of antic capers. The result—lucky us—is a hoot and a half." "[Hallinan] is a gifted writer with a knack for blending vivid settings, exciting plots, dynamic characters and clever humor to create captivatingly complex stories. From a lively description of a low-rent hotel room to the insightful development of Junior and Ronnie's relationship, King Maybe is distinctive and refreshingly original. It would probably be fitting to crown Hallinan the caper king." 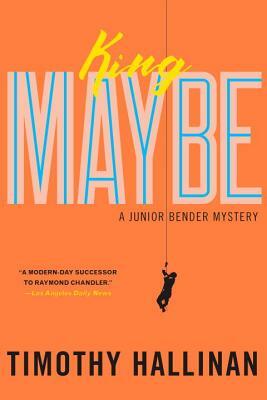 "Smart and spritely, full of wry humor." "There was a time when I thought that Lawrence Block’s character Bernie Rhodenbarr was the definitive fictional housebreaker, but that title has been surrendered by unanimous decision (mine) to Timothy Hallinan’s cat burglar extraordinaire, Junior Bender." "The curlicuing plot is itself the source of much of the appeal here, which is not to shortchange either the ever-quirky cast of bent but delightful characters or Hallinan’s dazzling style . . . Are there too many lovable crooks in contemporary crime fiction? Well, maybe, but one thing’s for sure: they’re all chasing Junior." "Twists and turns abound . . . A rare man of integrity in a world of tinsel and dust, Junior may steal for a living, but he has scruples and will do anything to protect his loved ones." "Hallinan is one of our best, and King Maybe demonstrates why." "[Junior Bender] walks the line between Dortmunder and Westlake’s more hard boiled creation, Parker. King Maybe has made me realize that line is more of a fissure that Hallinan drops into like a literary spelunker, going deeper and deeper with each book. From the looks of things, he has a long way to go before hitting bottom." "Tinsel Town glitters triumphantly once again . . . guaranteed to entertain all types of mystery fans." "[Hallinan has] earned a well-deserved reputation for writing smart and heartfelt stories about clever and cunning people who, when presented with two or more bad options, play all sides against one another to get through." "If you have a fondness for cat burglars with hearts of gold (like I do) and mysteries with wonderful stories and characters, I urge you to become acquainted with Junior." "Thanks, Tim Hallinan, for great entertainment and the best of twists and conclusions. And PS—I wish Donald Westlake could be reading your books now." "Smart and sardonic . . . An undeniable page-turner." "[Fans] will eat up [Junior's] adventures among Hollywood types whose moral senses are even more primitive than his." "There's no one quite like Junior Bender." "A modern-day successor to Raymond Chandler."